Boat race competition in Padang City has been started since the Dutch colonial government occupied Indonesia. At the time, it was called Selaju sampan (literally means paddling boat). The boats are decorated with colourful ornaments so the paddling boats in the competition will be more attractive. In 1995, Chinese people brought Dragon Boat race Competition around the world including Indonesia. Later on, its development in Indonesia occurs rapidly rather than other countries. Hitherto, Dragon Boat Race Competition is functioned by some regions having rivers on it, as annual event, national or international, by International Dragon Boat Foundation. In Padang, West Sumatra Province, Dragon Boat Race Competition takes place to commemorate the birthday of Padang City, on August 7th. Recently, Dragon Boat Race Competition takes place at international level. Dragon Boat Race Competition that takes place in Padang has some distinctions from other similar events in other provinces in Indonesia. Rivers in Padang tend to have broad side, calm water and constant stream. That is why; it is regarded as the right place for such event remembering its comfort offering challenges for the players to achieve the best results. This competition has some categories, 200 meters race, 250 meters race, 1000 meters race and 2000 meters race. For each team, there are three classes, 10 paddlers, 20 paddlers or 30 paddlers each team. Dragon Boat Competition in Padang will be more interesting when the home team joins the competition. In 2006, when the competition of Dragon Boat took place in Malaysia and in 2007 in China, the Dragon Boat team from Padang, Indonesia won the race. 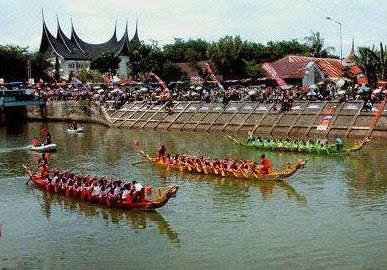 Dragon Boat Race Competition in Padang usually takes place in Sporthall of Haji Agus Salim, Padang City. West Sumatra Province, Indonesia. The event is commonly held on August. The location can be accessed by any kind of public transportation via Ketaping Airport – Padang City route. It is around 30 minutes from Ketaping Airport to Padang City. For you who want to spend more days around the location, you can easily find some comfortable lodgements and inns. For food and beverages, Rumah Masakan Padang are always there for you 24 hours.